This is not a new feature. But if you haven’t seen before, it’s worth to take a few minutes to read through and see if you can benefit from receiving a daily summary email of all changes made to your calendar. You may wish to be notified of changes to your Teamup Calendar, but want to avoid receiving multiple emails a day. You can choose to have one Daily Summary of all changes, rather than an individual email for every change. 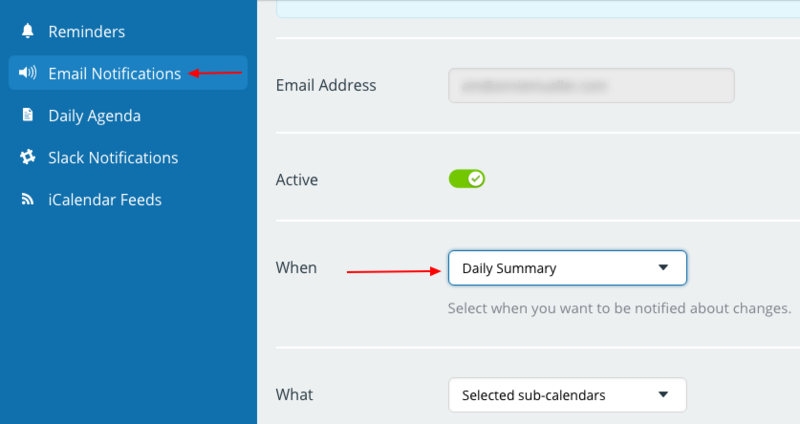 To set up a Daily Summary notification email, click the blue menu button in the top right of your calendar. Select Preferences > Email Notification. In the When section, use the drop-down menu to select Daily Summary. Then you can choose All sub-calendars or Selected sub-calendars. If you want your Daily Summary notification to include all changes to all sub-calendars, set the options to All sub-calendars and All changes. You can unsubscribe to the Daily Summary at any time by clicking on the Manage your notifications link in the bottom of your Daily Agenda email. Be aware that all your notification subscriptions (including Daily Agenda and Change Notifications) that have been set up with your email address are listed along with the calendar links used to set up those subscriptions. You could unsubscribe any of them conveniently in this one place. Because of this, however, it is important that you do not share or forward your Daily Agenda email to anyone else because doing so would allow others access to all your notifications subscriptions and your other calendar links.